Biplob Kumar Sarker, a police official in Dhaka, spoke after a blogger was killed in a machete attack by three men in Bangladesh’s capital on Monday. Video By Associated Press on Publish Date March 30, 2015. Photo by Suvra Kanti Das/Agence France-Presse — Getty Images. DHAKA, Bangladesh — When the steamy, clamorous evening had settled over this city, and Oyasiqur Rhaman had finished his day’s work at a travel agency, he would turn to one of his favorite pastimes: Poking fun at fundamentalist Islam. On Monday morning, after he left home for the travel agency, Mr. Rhaman was killed for what he had posted. Three young men — among them students of madrasas here in the capital and in Chittagong — surrounded him and sliced at his head with machetes, cutting deep gouges into his forehead, face and throat. His body was left on the pavement in a pool of congealing blood. Two men were captured by local residents and handed over to the police, according to Mohammad Salahuddin, who heads the district police station. Those men said an acquaintance known as Masum had instructed them to kill Mr. Rhaman because “he made some comments against Islam” on social media, but that they had not read the comments themselves. The killing closely followed the pattern of another five weeks earlier, when young men with machetes surrounded a secular blogger and author, Avijit Roy, as he left a book fair. Mr. Rhaman took Mr. Roy’s murder to heart, changing his Facebook profile image to read “I am Avijit.” Over the next few days, he also mourned the 2013 killing of another blogger, Ahmed Rajib Haider, known online as Thaba Baba, and vowed to keep fighting. The deaths of Mr. Roy and Mr. Rhaman this month have sent a chilling message to the country’s secular bloggers, who say they are competing for the hearts and minds of young people exposed to oceans of material promoting conservative Islam. Mr. Haider, Mr. Roy and Mr. Rhaman were all swept up in the 2013 Shahbag movement, which called for the death penalty for Islamist political leaders who were implicated in atrocities committed during the 1971 war for independence from Pakistan. The movement was met with a passionate response from young Islamist activists, deepening a divide among members of the same generation over whether Bangladesh is, or should be, a Muslim state. Omi Rahman Pial, another prominent blogger from the same group, said he heard from five activists on Monday who said they were considering seeking asylum outside Bangladesh. Arif Jebtik, another activist, said that more “have begun shutting their blogs down” under pressure from their families. 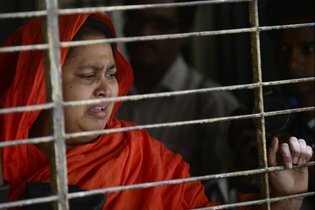 It has always been risky for Bangladeshi intellectuals to criticize Islam, but when they fled the country, it used to be to avoid prosecution, not extremist violence, said Sara Hossain, a Bangladeshi supreme court lawyer. Many people here had a mixed reaction to Mr. Roy’s death, condemning the violence but also taking issue with his views. Monirul Islam, a police official who is overseeing the investigation into Mr. Roy’s death, said the police have seen a pattern of attacks on writers and intellectuals. Those involved are often well-off, Internet-savvy young people, he said, and not the impoverished men who typically committed such crimes in the past. Mr. Islam said the attackers operate in small groups and have been active so far in eight to 10 of the country’s 64 districts. “At this stage, their strategy is silent, targeted killing,” he said. 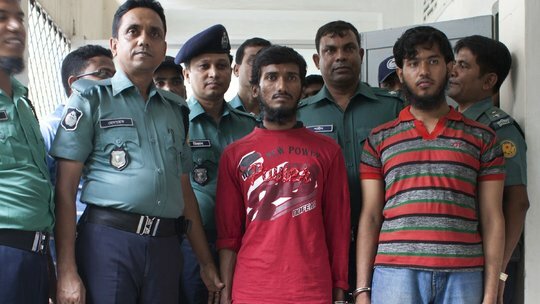 Though the killing of Mr. Roy happened more than a month ago in a crowded street full of witnesses, the police have so far made only one arrest — Shafiur Rahman Farabi, who called for him to be murdered in a Facebook post. Mr. Islam said Mr. Farabi “disclosed some information,” and that the police have identified additional suspects, a group of men not directly connected with Mr. Farabi. He said he believed more than five people were involved, and that several of them probably attended North South University. The authorities were luckier on Monday, when bystanders caught two men trying to flee the scene; a third man escaped. In an exchange with journalists, the two suspects seemed remorseless, according to Mohammad Jamil Khan, a reporter for The Dhaka Tribune. Julfikar Ali Manik contributed reporting.